Embayment of ridges and troughs in a portion of the Sippar Sulcus area of Jupiter's moon Ganymede in this image from NASA's Galileo spacecraft is interpreted as evidence that the low-lying area was filled in by flooding with low-viscosity material, such as water or water-ice slush lavas. Bays of the material appeared to have formed in troughs (indicated by arrows) between the ridges. The smallest features visible are about 180 meters (590 feet) across. Analysis of such high-resolution images in combination with estimates of the features' relative elevations is helping scientists interpret the roles of volcanism and tectonics in creating the bright terrain on Ganymede. This image was prepared by the Lunar and Planetary Institute, Houston, and included in a report by Dr. Paul Schenk et al. in the March 1, 2001, edition of the journal Nature. The Jet Propulsion Laboratory, a division of the California Institute of Technology in Pasadena, manages the Galileo mission for NASA's Office of Space Science, Washington, D.C. Images and data received from Galileo are posted on the Galileo mission home page at http://www.jpl.nasa.gov/galileo. 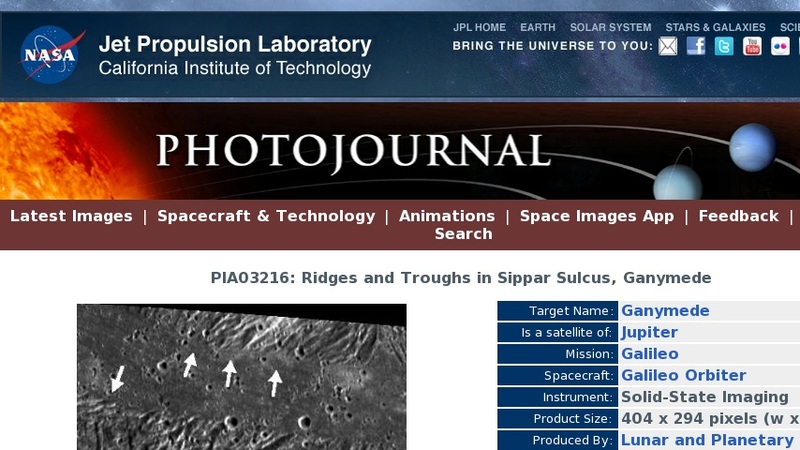 Background information and educational context for the images can be found at http://www.jpl.nasa.gov/galileo/sepo .